Samsung Galaxy Tab 3 prices leaked online | What Hi-Fi? Prices for the Samsung Galaxy Tab 3 range have been leaked online ahead of the Samsung Premiere 2013 event tomorrow. The new tablets look like costing around £200 for the Galaxy Tab 3 7-inch model and in the region of £300 for the 8-inch model. The 10-inch model is expected to set you back around £380. The prices have only been released in Euros so far, as spotted by CNET, so give or take a few pounds either side. 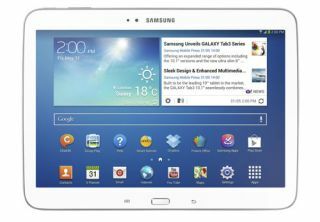 Samsung recently expanded its Galaxy Tab 3 range of tablets with the introduction of the 8in and 10.1in models, which join the already announced 7in Galaxy Tab 3 tablet. The new Tab 3 models don't have an official release date as yet for the UK but are set to be available in 4G LTE, 3G and wi-fi versions. Screens are 8in (below) and 10.1in (above) WXGA TFT with resolutions of 1280 x 800, the former delivering 189 PPI (pixels per inch), the latter 149PPI. Both run Android 4.2 Jelly Bean, feature front and rear cameras and support a multitude of audio and video formats. AptX Bluetooth streaming and USB connectivity come as standard, and the Galaxy Tab 3 8in gets a 1.5GHz dual-core processor, while the 10.1in version is fitted with a 1.6GHz one. Each comes with 16GB or 32GB of internal memory, which can be expanded via MicroSD up to 64GB. The Tab 3 8in measures 20.9x12.3x0.7cm, and weighs 314g, while the Tab 3 10.1in measures 24.3x17.6x0.8cm and weighs 510g. Special features on the Tab 3 8in include S translator, which provides instant translation through voice recognition and via text on application sincluding emails, texts and ChatOn. The Tab 3 10.1in gets smart remote and MHL (TV Out) capabilities. Samsung is expected to announced details of new Galaxy and ATIV tablets, and possibly phones, at its Premiere 2013 event on Thursday 20th June. The company has already confirmed the new Galaxy S4 Mini phone, to sit below the flagship Samsung Galaxy S4.